Je Suis Charlie? I’m not so sure. I think it is possible to celebrate the courage of the cartoonists of Charlie Hebdo, murdered in a terrorist attack on Jan. 7, and at the same time be disturbed by the racially charged, offensive images that those same artists created. I am concerned that in rightfully lionizing the courageous staff of Charlie Hebdo, that racist images of hook-nosed Arabs will become more common, and even accepted by well-meaning people who want to take a stance against terrorism and stand up for freedom of speech. Can you imagine if Asians were the ethnic group in question and yellow-skinned, buck-toothed images became commonplace? Images that mock and denigrate can only push an ostracized minority further from the mainstream. It may be “politically correct,” but here in the U.S., no mainstream publication would be able to regularly publish such images without receiving considerable blowback from civil rights groups and the public at large. This one is tough. In a free society there should be the right to offend and to be offended. A victory over terrorism would be to ensure that the work and mission of the men they killed lives on. And yet … when the content of the message condones intolerance, then a distinction must be made. Honor the messenger, not the message. Japanese are depicted invading California in a cartoon by Dr. Seuss published on Feb. 13, 1942. It’s a great power that cartoonists have, to create simple images that cut to the beating heart of an issue. In a few brushstrokes, political cartoonist Bill Maudlin conveyed the weariness of war and the plight of the average G.I. better than thousands of words ever could. As an exchange student at Waseda University in Tokyo, I drew what I thought was a harmless cartoon and posted it at the Kokusaibu, the common area where foreign exchange students gather. It was Thanksgiving, and many of us foreigners were homesick and thinking of the traditions we were missing back home. In a turnabout on a familiar Thanksgiving trope, I drew a turkey stalking a pilgrim, but wielding a samurai sword and wearing a hachimaki. Later, our advisor told me that an older man saw the image and angrily ripped it from the wall. I never knew what his position was or why he had such an emotional reaction. Was he offended by the stereotyped portrayal of Japanese themes? Was he a right-winger, a left-winger, or just someone without a funny bone? Did he think a racist person drew the image? I think the worst offense for any cartoonist is an image that is so lazy and poorly conceived that the reader misses its message. What I drew just wasn’t funny, but hey, they can’t all be great. Once it’s on the page, that’s it. It becomes open to interpretation by the viewer, and his life experiences will inform his perceptions. Do I, as an Asian American, get a pass to draw Orientalist racist images of Asians? It’s a question Margaret Cho and her critics are asking after her yellowface portrayal of a North Korean officer on the Golden Globes over the weekend. As the only Asian onstage before a room of Hollywood’s (predominantly white) elite, it seemed to be a metaphor for how Asians are portrayed and perceived in the entertainment industry. Editorial cartoonists are almost overwhelmingly white and male, with few exceptions such as the brilliant Ann Telnaes of The Washington Post and Michael Ramirez, who is half Latino and Japanese American. Like the call for more diversity in the newsroom, more diversity among cartoonists would bring different perspectives in their interpretations of the news. And yet, if there is a tribe that is as open, friendly and loving of a good laugh, it is cartoonists. I’m not sure if I could call myself one, but the cartoonists I’ve had the privilege to meet have been unfailingly generous and kind. Good folks. One of the most poignant videos from the past week was posted by The New York Times of the staff of Charlie Hebdo, including several who were killed, brainstorming the cover of an edition from a few years ago. Their creativity, audacity and humanity is so heartbreakingly evident. The cover image created by Cabu was one of the prophet Mohammed. The video showed the creation of an image that he died for. We should celebrate their bravery, their willingness to be offensive, and also celebrate our right to be offended. I appreciated your thoughtful commentary on the difficult issues raised on both sides of our freedom of speech rights. 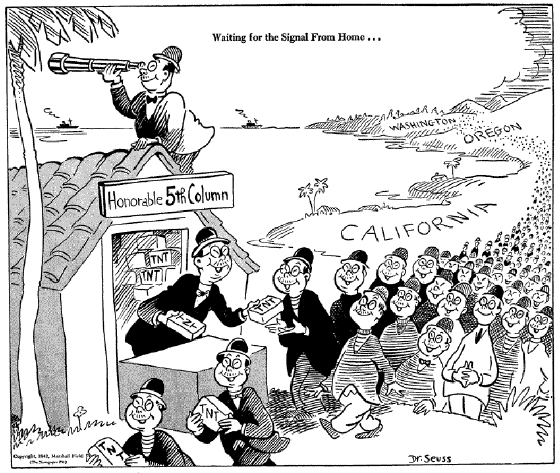 Your reminder of the cartoon forms of anti-japanese racism following Pearl Harbor instantly clarified for me the reasons for offense taken by many in the Islamic community, and counterbalanced the truth of “je suis Charlie” with the equal truth of “je sui Islam.” Thank you for the difficult labor of examining the world with an open, sensitive mind, and for provoking our thoughtfulness. Akemashite omedetou gozaimasu.